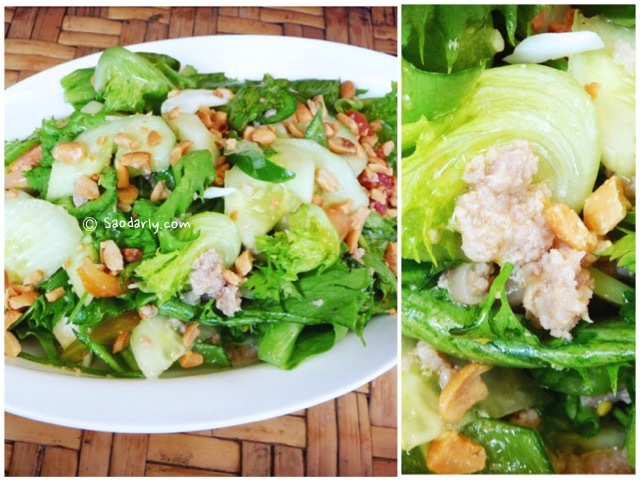 Making Yum Salad ( ຍຳສະຫຼັດ; ຍຳຜັກສະຫຼັດ) for dinner in Vientiane, Laos. My aunts used lean pork in the dressing instead of chicken breast. We bought all the vegetables and herbs from the Organic Market held at That Luang esplanade. If you are a big fan of organic produce live in Vientiane, then you can visit the market on Wednesday and Saturday morning from 6:00 AM to noon. The Yum Salad was delicious and I ate a whole bowl by myself. My relatives ate the salad with steamed jasmine rice and also with sticky rice. When I was a kid and living in Laos I used to eat Yum Salad with sticky rice as well. There was not enough of the salad to go around and eating the Yum Salad with balls of sticky rice in a bowl was a way to feel full. Looks delicious! 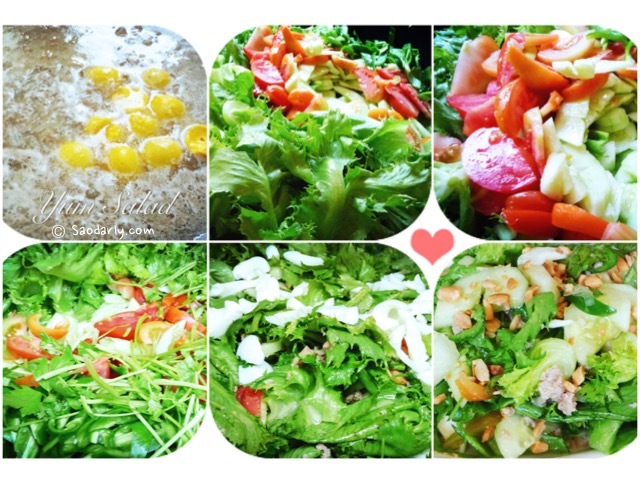 I remember this salad that friends made for me when I was in Laos. Would you PLEASE PLEASE post the recipe, so I can make it myself?! I know that for the dressing the egg yolk of hard boiled eggs is dissolved in hot oil. ANd then…?? I am sure there is nam bla in there as well, right? Thank you! You put the hard boiled eggs in the oil, only the yolk part and keep the white part to put on top of the salad when you mix all the ingredients together. To get the nice aroma and for taste you would add crushed garlic in the oil before adding the egg yolks. A bit of water is added to the pan to make the dressing. For seasonings you need salt, sugar, fish sauce, lime juice, soy sauce, and MSG is optional. Top off your salad with crushed roasted peanuts.